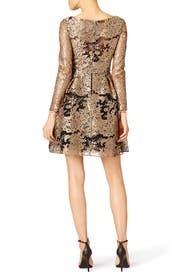 Renaissance-inspired gold elevates this sweet, feminine dress Marchesa Notte. The full-shaped mini makes it work with both flats and heels. 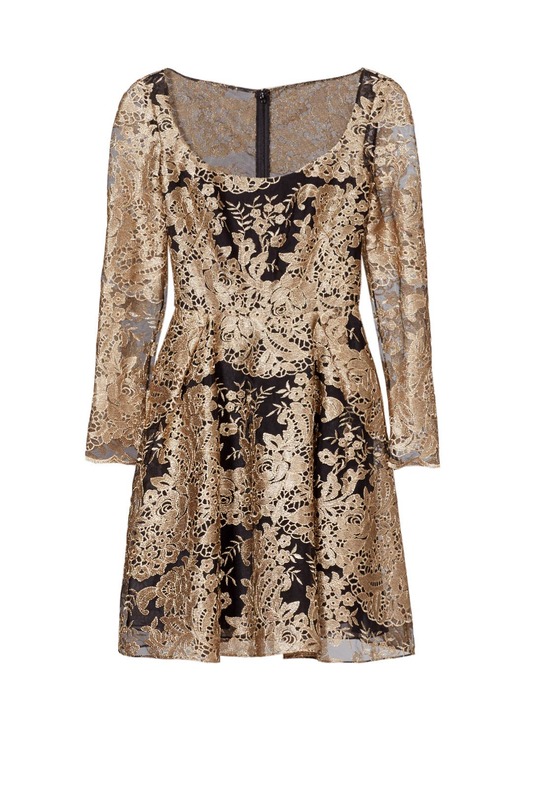 Gold and black floral print tulle (100% Nylon). Long sleeves. Scoop neckline. Full skirt. Hidden back zipper with hook-and-eye closure. Partially lined. 36” from shoulder to hem. Imported. Dress was beautiful. It definitely had some sparkle to it and was slightly more puffy than I expected due to a layer of tulle. 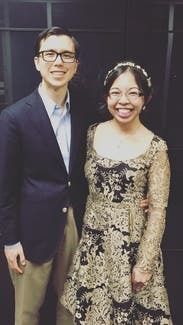 It was a very appropriate dress to wear to a family wedding...no cleavage (although I'm small chested) and I didn't have to worry about it getting too short while dancing. I did have to wear a strapless bra because the neck is cut rather wide (one of my favorite parts about this look). 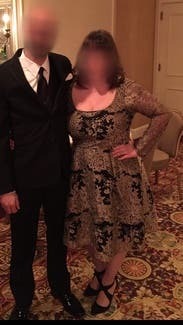 Only cons: along the zipper seam the layers are not sewn together all the way down...I initially thought the dress was ripped but it was on both dresses so I'm assuming it was meant be there. You can't see it really but if you bend down the layers separate and expose the black lining. The other con was the smell of the dress when I received it...the dress was nice and clean but had a very distinct sweet smell to it. Maybe it was dry cleaning chemicals? I ended up steaming the dress to try and get the smell out. Even my boyfriend commented on the smell. It's not that it smelled bad it was just SO strong. But overall it was a beautiful dress and I received a lot of compliments. I got TONS of compliments all night! So comfortable and gorgeous! 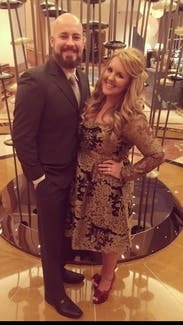 I wore this dress for a fall wedding in Vegas. I felt amazing and I got soooo many compliments on it. 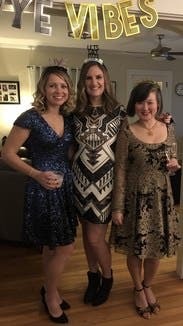 I wore a size 16 (compared to my usual 12), so the dress definitely runs small! Even the 16 was really tight in the bust area. It was also quite itchy... But it's the price to pay for fashion ;-) I loved the whole RTR experience. 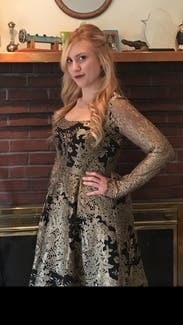 I wore this to a wedding. I normally wear an 8 but it was too tight in the bodice. I ended up wearing the 10 for a more comfortable fit. I got so many compliments during the night! I did get a bit warm in the dress after dancing. Overall, I was very happy with it! Beautiful dress but not totally what expected. The gold detailing was beautiful, more pronounced on the dress than you would except from the picture. The neckline looked a little too Renaissancey for me once on and the arms were quite tight. A bit too tight, scratchy, uncomfortable. Also a longer than expected from the photo. 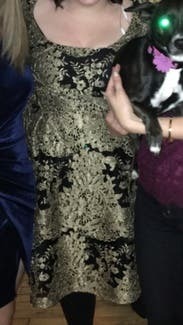 Did look stunning in low lights at a holiday party. BEAUTIFUL lace detail! This dress is gorgeous! Fits true to size. 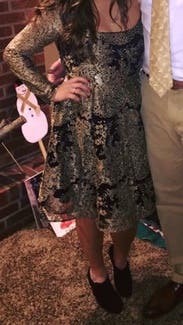 Wore this for Christmas Eve and at the time I was more a size 12, should have gotten that but I got a 10 instead. Was still able to wear just somewhat snug. Has boning and tulle underneath the skirt but I didn't feel like it was too much tulle. Got so many compliments! 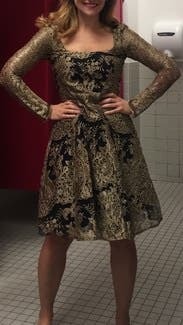 Felt very pretty in this dress with all the lace detail! 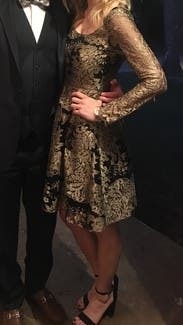 Perfect dress for a formal winter wedding! 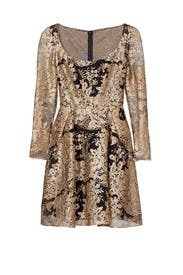 Gold lace added a special touch to a little black dress. Great for dancing. All the compliments and how photogenic the dress is. Someone told me I looked like a princess. No complaints here =) great fit and perfect for tall girls who have trouble finding dresses long enough! This dress was a little tight in the shoulders but was great otherwise. 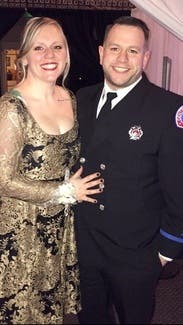 I loved wearing it and it made the party fun. 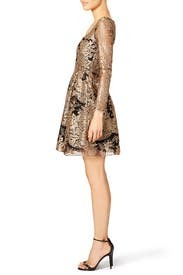 I rent this dress for a new year party. The color is gorgeous. The chest is a little bit tight and not very comfortable with the material. I LOVE rent the runway, this is the second time I have used them! My dress fit wonderfully and I got compliments all night long! Absolutely stunning. Loved this dress! Great fit, gorgeous detail. So many compliments. Did not feel sleeves were tight and I don't have small arms. Definitely recommend! Georgeous fabric in very figure flattering shape. This dress fit like a glove and was very figure flattering! It managed to successfully disguise my little belly pouch left over from my pregnancy. I felt comfortable dancing all night. 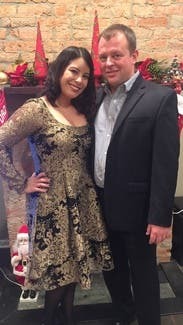 The dress revealed a hint of cleavage without being overwhelming and the long sleeves made it perfect for a winter wedding. Fit a little snug in my opinion, but friends said it didn't look it. I am a true 12 and wore the 12. It was glamorous and perfect and I'm obsessed with the neckline! 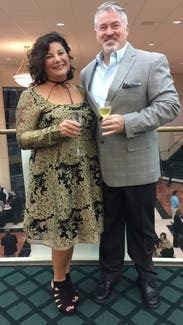 Worn for an anniversary dinner! 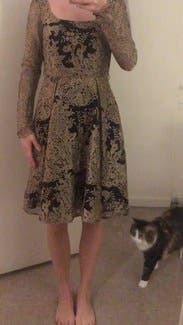 Received many compliments on this dress -- however it was not without issues. The lace is clearly very delicate and had snagged from previous wear. Also the waist line is at an awkward place making the top fit more snug than I would like. The sleeves are pretty but also itchy from the lace detail. Not an ideal dress even though it looked so beautiful online. 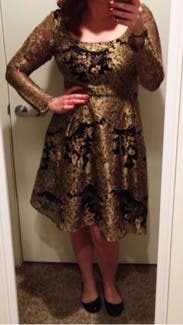 I received so many compliments on this dress! It fit beautifully and was perfect for the occasion. This dress is beautiful and very comfortable. It's prettier in person than in the picture! I highly recommend renting this for a dressy affair. It fit perfectly, in every way! I love everything about RTR! Perfect fit for a curvy girl. 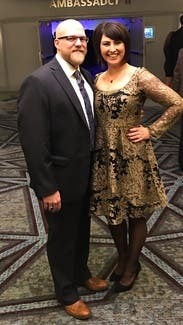 I received soooo many compliments and gasps when people saw me in the dress... followed with sincere compliments on how gorgeous my dress was.... and those compliments came from strangers! I can't for my next occasion to RTR! 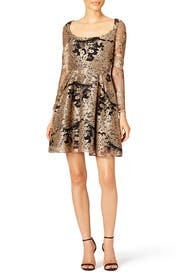 Perfect fall wedding guest dress! The fit was just right. The dress was both elegant and comfortable. I would strongly recommend it! So beautiful, compliments all night! Dress was absolutely beautiful, it is a little stiff so I steamed it a little bit and it loosened up and laid better. Sparle and lace! Exquisite fabric! Beautiful! But tight in the sleeves and quite itchy! But great for a holiday party! This is a very beautiful dress, but I was unable to wear it because it was just too tight on my arms. I'm usually a size 4, but I would've been better sizing up. I'm a pretty standard 14 or 16, this 16 fit me but it was a little tight in the arma and felt restrictive so I ended up not wearing it. Also, it looks much shorter on the model then it is. I'm5'10 and the length was good on me ! 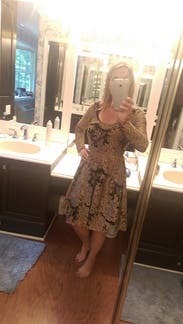 The sleeves and chest on this dress are very slim. The sleeves have 0 give. I would not recommend it for anyone above a C cup or it may not zip up the back. Overall, unless you have a very slim figure size up if you want to try this dress. I'm usually an 8 or 10; the 10 fit but it just wasn't flattering. The skirt was fuller than I expected and I thought it made my waist look thick. As others have mentioned, the sleeves are stiff and very scratchy/itchy. Much like a teapot, I'm short and squat. I was a little worried that I would be able to move once this dress was zipped, but the material is surprisingly flexible and forgiving. Overall the dress was extremely flattering and hid most of the areas that I was worried about. People were complimenting me all night. The photos don't do this dress justice. 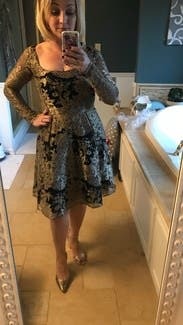 Great dress for a cocktail party. Fit is true to size. Do not attempt to zip it alone. If you do not have help- you will not get this dress zipped. Neck line is wide- so you will need a strapless bra- or to go without. The bust is snug- so braless is ok. I rented this for my work holiday party. It was cute but a little matronly. The gold is not very bright, more of a brass color. It's a little tight in the chest and sleeves. This dress is beautiful but I opted for another dress to wear. It's broad in the shoulder area and really shows your neckline and I like the length and the gold fabric is really stunning! Fits well for smaller frames! Rent it for a summit and i got a ton of compliments. 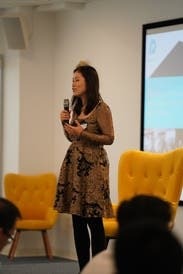 It is dressy but yet appropriate for work events. Wish I owned it! 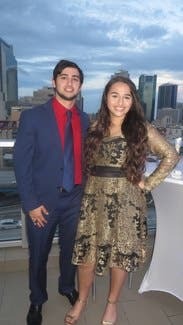 The dress was beautiful, but the zipper was hard to get up. The sleeves are itchy, but I stuck it out. Fits pretty true to size but was a bit snug in arms, too big in chest. Rented this for NYE, a complete hit! Got lots of compliments! Feeling so royal! The dress was really very well made, the laces are so intricate and delicate, simply divine! I'm 5'2, 128 pounds and worn size 6, fit was perfect! Just not for me but beautifully constructed. Received this as a backup. Dress was pretty but I felt a little frumpy and did not wear it. I usually wear a 6 and the 4 fit well. It was pretty for a dinner out.